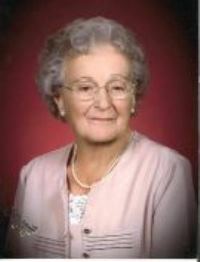 IVA C. HUBBELL, 98, of Jasonville, Indiana passed away at 2:16 p.m. Thursday, January 10, 2019 in Shakamak Good Samaritan Center, Jasonville, IN. She was born January 19, 1920 in Vigo County, IN to Charles Horton and Effie (Ellis) Horton. Iva married Ray Hubbell on July 13, 1940 and who passed away on December 17, 1996. Survivors include her children, Shirley Strahla of Linton, John Hubbell (Sue) of Jasonville; grandchildren, Sherry McQueary (Kent), Jon Ray Hubbell (Regina), Michael Hubbell (Stacey); 14 great-grandchildren; 14 great-great-grandchildren; several nieces and nephews; special canine companion, Tippy. She was preceded in death by her parents; husband, Ray Hubbell; siblings, Gretchen Horton, Loa Nevins, Agnes Sinders, Juanita Shonk, John Horton; son-in-law, Melvin Strahla; great-granddaughter, Meranda Hubbell. Iva was a homemaker. She was a Charter member of the Faith Southern Baptist Church in Clay City. She recently attended the Wilson General Baptist Church. Arrangements are entrusted to Michael W. Cox, Cox Funeral Home; 218 South Meridian Street; Jasonville, Indiana. Visitation is scheduled from 11 a.m.-2p.m. Monday January 14, 2019 at the Funeral Home. Funeral Services will follow at 2 p.m. with Pastor James Phipps and Jack Simpson officiating. In lieu of flowers contributions may be made in memory of Iva to American Cancer Society. Envelopes are available at the funeral home.